A VERY big thank you to Bea of Bulging Buttons for nominating us here at Girls vs Blog for awards!!!! We are so thrilled and honored! 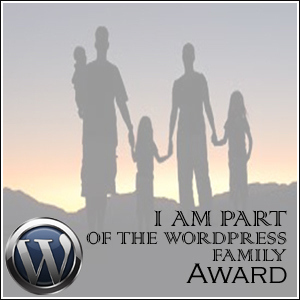 Rules: Display the award on your blog, link back to the person who nominated you, nominate 10 others you see as having an impact on your WordPress experience and family. 3. 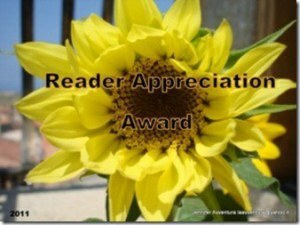 Reader Appreciation Award for those who like and comment on a regular basis. Rules: Display the award logo, thank the blogger who nominated you and link back to his or her blog. 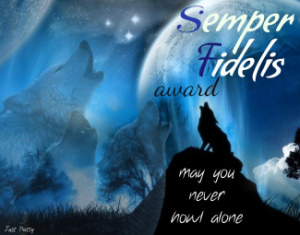 Answer the 11 questions that your nominator asks you, post 11 random facts about yourself, nominate 11 bloggers of your own, with under 200 followers, whom you think are as awesome as you, and create 11 questions for your nominees. This little part was added by the wonderful blogger who nominated us and we think it fits…so we’re keeping it! Disclaimer: I don’t always know how many people follow your blogs. I don’t always know who has visited mine. These are blogs that are meaningful to me for various reasons all covered in one way or another by the above awards, so let’s not get too hung up on the particulars, and have some fun checking out some great blogs and bloggers. Bulging Buttons – Yes I’m nominating you back! I love your Happiness Project 47 for 47! The 11 questions answered…x 2! Of what are you proud? I’ve still got a few of my marbles left. I haven’t lost them all. Of what are you afraid? Moths. They are evil creatures of the night. Other than writing, what are your creative outlets? Art, music and rearranging furniture. How do you take care of yourself? You have to have a few minutes every day to just think and chill out. How do you know when you’re done writing a piece? I complete my thought (s) and feel like I’ve made a point clearly. What stupid things have you done that you don’t regret? once Lexi and I went skinny dipping up in the mountains as teenagers. Stupid, cold, and I’m still convinced there might have been a Kraken in there somewhere. Still totally fun and I can say that I actually went skinny dipping. Besides, that was as wild as we got and we were still back by curfew. If you had to move somewhere new, where would you go? Tuscany. What is your favorite time of the day or night? Why? Right after bed time when you collapse on the couch with a stash of munchies and watch big girl TV. What is something you miss from your childhood? Lack of bills, stretch marks and being blissfully oblivious to life’s dramas. Of what are you proud? Of getting this award! Of what are you afraid? Many things…mostly that which I don’t know, but occasionally I am burdened by knowledge (nursing) and find the greatest fear in knowing not what will…but what MIGHT happen. Other than writing, what are your creative outlets? Travel (making the itineraries and then following them), cooking, butchery, sewing, singing loudly in the car on the way to work, knitting, painting, and anything else I find myself inspired to try day to day. How do you take care of yourself? This one is a bit more difficult to answer as it could be in reference to so many things… I try to eat fairly healthy, exercise regularly (not gym crazy just run and around and have fun), laugh often, and try to remind myself not to be so serious about everything. How do you know when you’re done writing a piece? Some pieces are never finished…those that are I count as finished when I can think of nothing further to say…and it has an ending I find suitable (which is to say…I don’t find it particularly lacking). What stupid things have you done that you don’t regret? Hmmm…I moved to Egypt on a bit of whim. Lived there 18 months and worked for the DOD. Looking back…moving to Egypt as a 20 year old girl may not have been the smartest thing I have ever done…but it was a heck of an experience for sure! If you had to move somewhere new, where would you go? New as in somewhere I have never been…or just somewhere different from where I am now? I would move to Italy or England in a heartbeat (been to both). I think I would move to Spain or Japan with little to no quarrel as well (haven’t been to either, but would like to go.) Stateside…I think I would move to most states at least temporarily…I rather like California though…I like the sun and the beaches. What is your favorite time of the day or night? Why? Perhaps just before getting up in the morning. Those last few minutes of warm snuggles get me every time. What is something you miss from your childhood? Being able to eat whatever I want and not have to worry about it! Seriously I know that is simple but I LOVE to eat…so not having to think about calories, or workouts, or how my pants will fit later would be AWESOME! What was your favorite book in fourth grade? Can’t remember. Sadly I didn’t enjoy reading as much then as I do now. Our 11 Questions for our lovely award winners! 1. If you were a craft what would you be? 2. What’s an irrational fear that you have? 3. What is one of your favorite meals? 4. What is the song that repeatedly gets stuck in your head? 5. Who would you have been in a previous life if you had to pick someone? Why them? 6. What decade do you think you should have been born in, if not the one you were? Why? 8. What is a serious issues involving women you would like to see better addressed on blogs? 9. Are there any issues on women or human rights you are sick of seeing on blogs? 10. Where is your favorite vacation spot? Where do you want to vacation but haven’t yet? 11. What is one admitted guilty pleasure or bad habit you refuse to break?